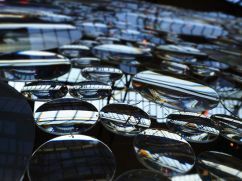 The so-called 4th Industrial Revolution is increasingly changing the control and regulation of technical building processes as well as the maintenance of those systems. 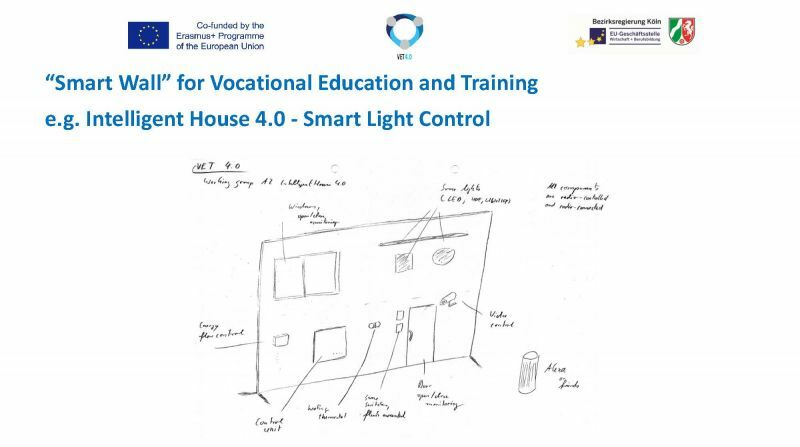 This concerns to small apartments as well as large commercial buildings, and this development requires an appropriate adaptation of the competencies of the persons which are educated and employed in the field of building services engineering and home-automation on the qualification level EQF4. 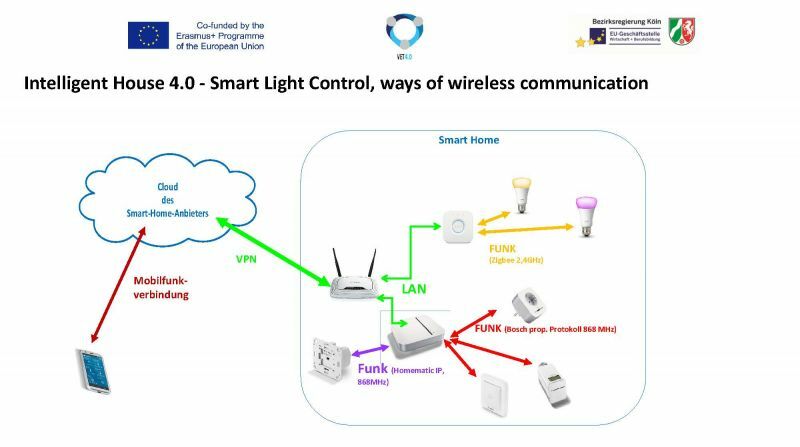 In this project the students will discuss the current possibilities, benefits and risks of home automation. Further on the students will realize simple automation tasks with the help of standard smart-home components. means a narrative scenario which is presented in an authentic situation. You are working in a small electro installation company. 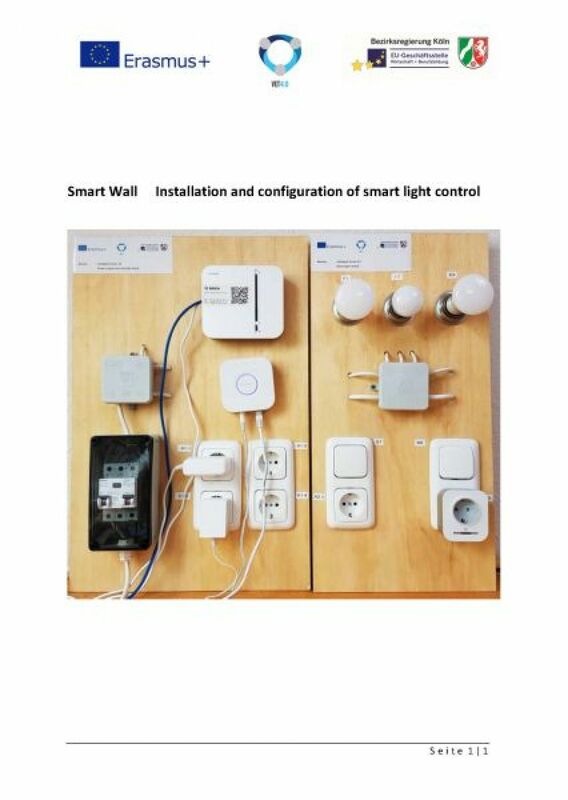 A long-time customer of you company gives you the order to complement and to expand the existing electrical installation step by step with smart home components. The existing electrical installation is realized by a conventional installation. 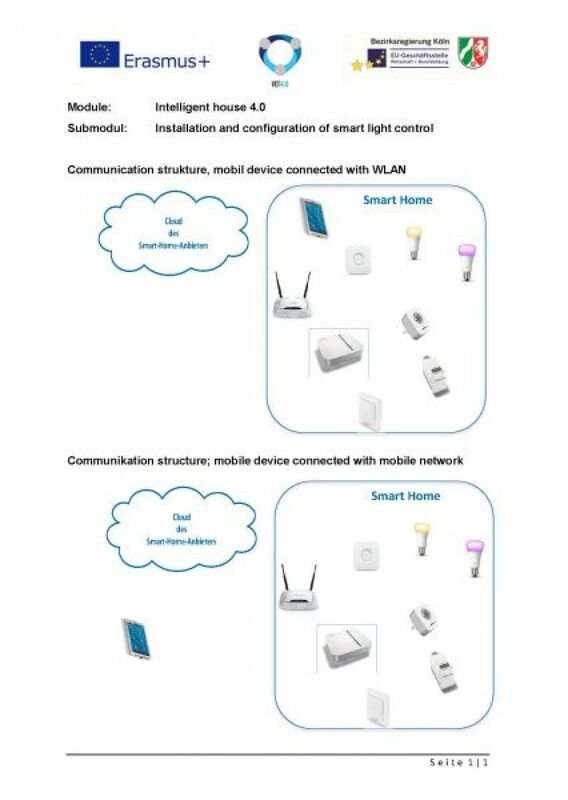 The customer wants to make the transition to smart home components gradually, in order to gain own experience with the new technology. 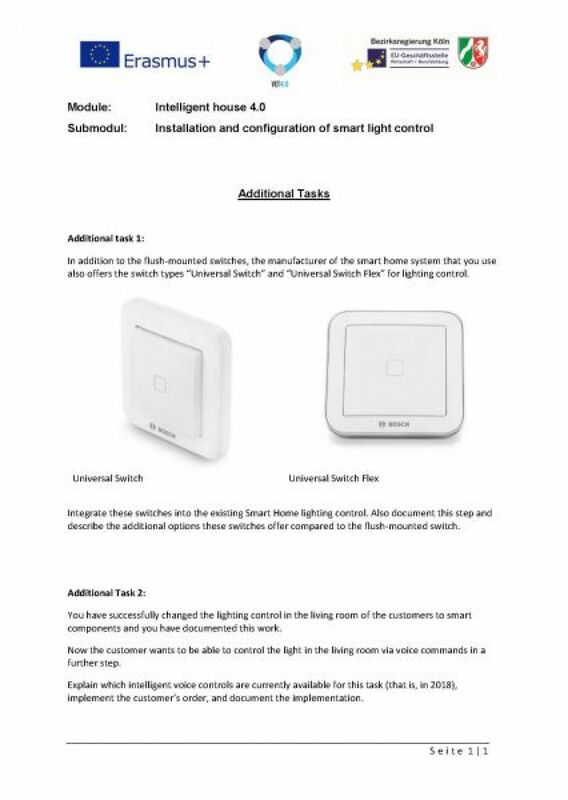 For this purpose, in a first part of the project the lighting control in the living room will be switched to "smart" switches. 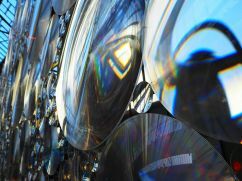 Furthermore, the existing energy-saving lamps are to be replaced by LED lamps. With the new LEDs, the colour of the light could be changed via the app. Also the customer wants to be informed about additional automatization functions that could be realized with the app, and also about the risks of using smart home devices. floor lamp, which is connected to the power supply via a 230V socket. 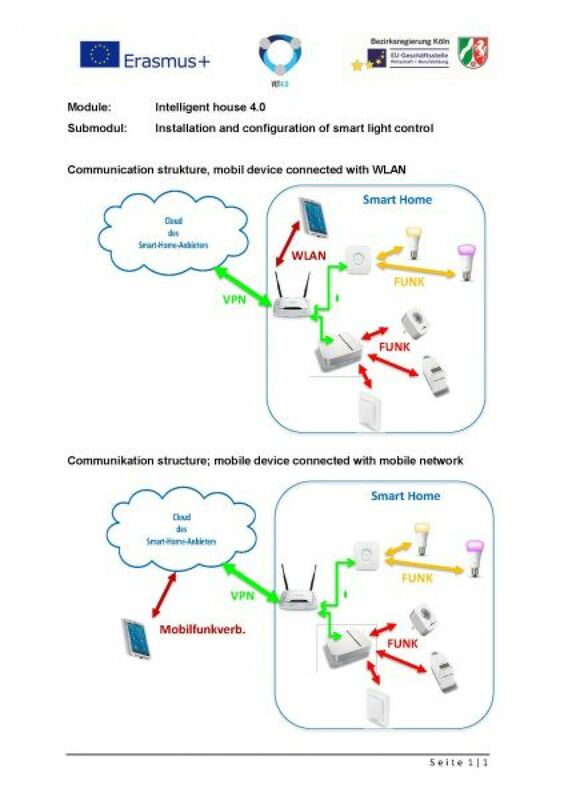 In a first task the control of the floor lamp and the conventionally constructed two-way circuit should be replaced by smart home devices. 1. Start by planning the required workflow and document your workflow. 2. Discuss your workflow with the other members of your learning group and correct it if necessary. 3. After documenting your planning, please realize the work steps by using the smart wall. 4. Document the working steps you have done. 5. 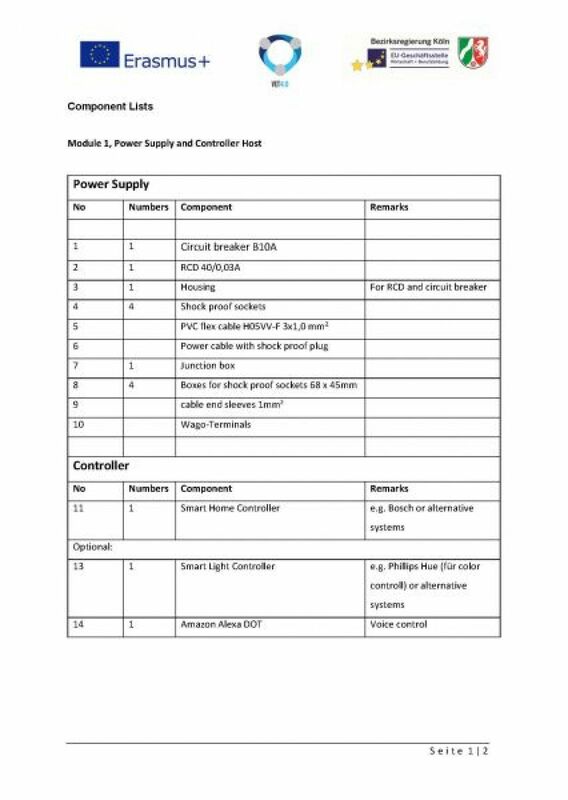 Document the problems during installation and configuration as well as the way to solve those problems. The students will realize the tasks described before by using the “Smart Wall”. 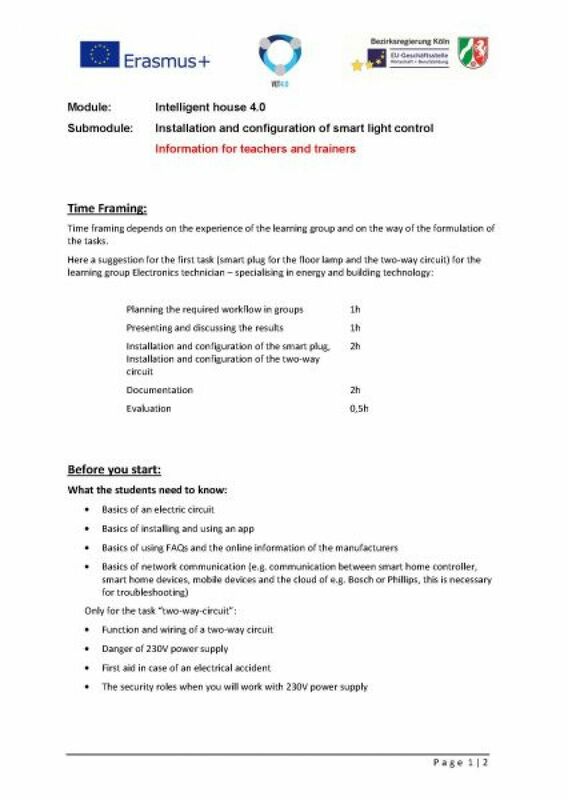 After installation and configuration they will test the function of the smart home devices and thy will discuss with the other students the results and the problems that occur. 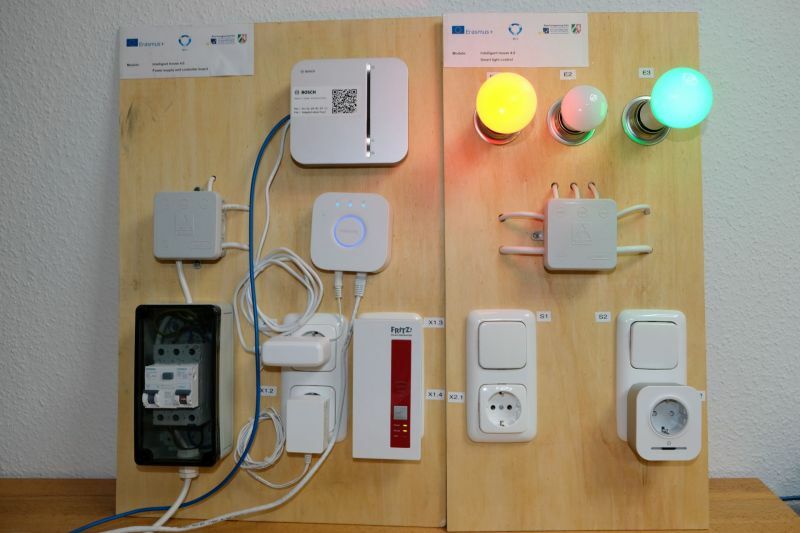 The Smart Wall is an experimental setting which contains a conventional two-way circuit, Controller for Bosch smart home devices and for Phillips hue light as well as the 230V AC power supply. 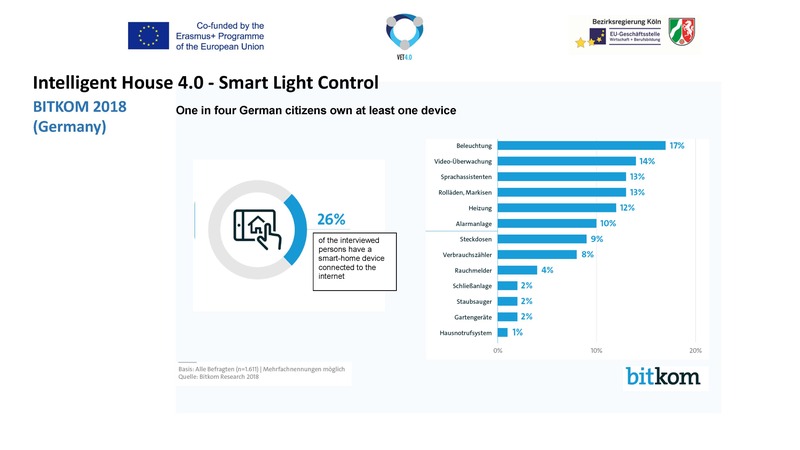 The results can assess by: * Function check: Does the smart home device react in such a way as I have configured with the app? Video documentation: The students will produce a small video clip that explains the installation- and configuration process. 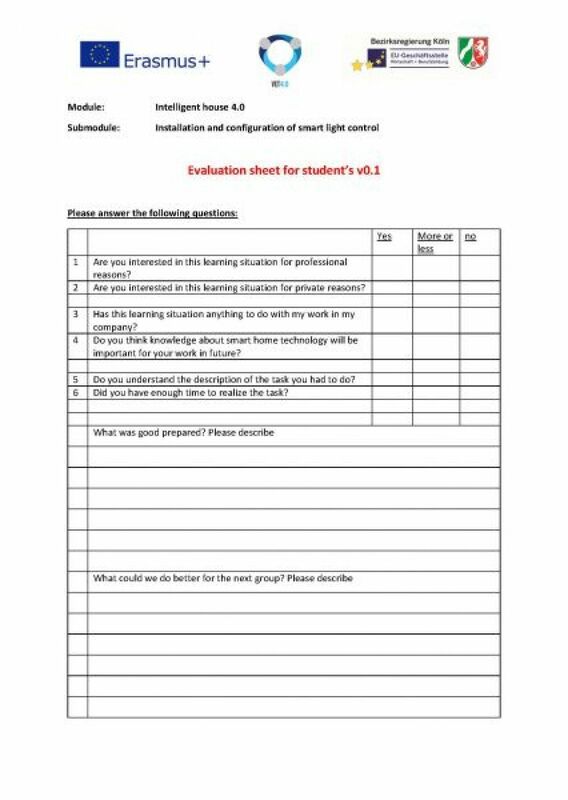 * Answering questions of an online tool: Teachers/trainers formulate questions which must be answered by the students when they will install and configure smart home devices successful and when they have to explaining how smart home systems will work. Those questions will be presented to the learning by an online quiz, like kahoot or quizlet. * Project documentation: The students will write a process-orientated project documentation. 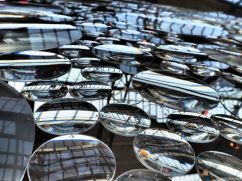 The reflection could be done be an online questionnaire. Also reflection of the process and the experience of the students will be part of the video documentation or the process-orientated project documentation. 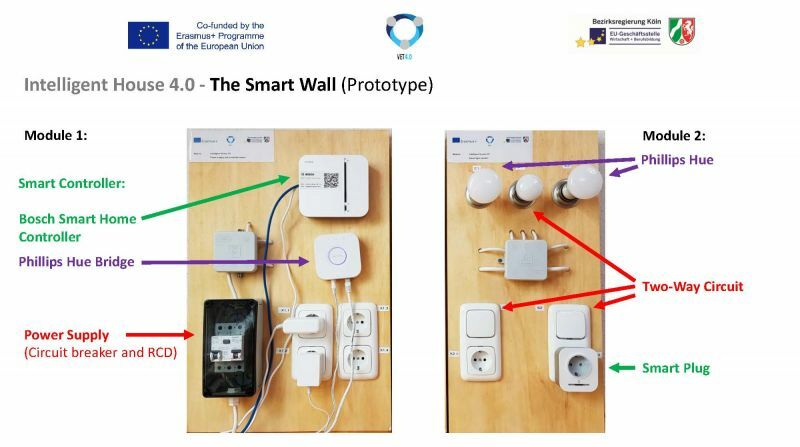 The setting could be realized with the experimental setting “Smart Wall"
Depending of the learning group, the task could be formulated open or in narrow steps. 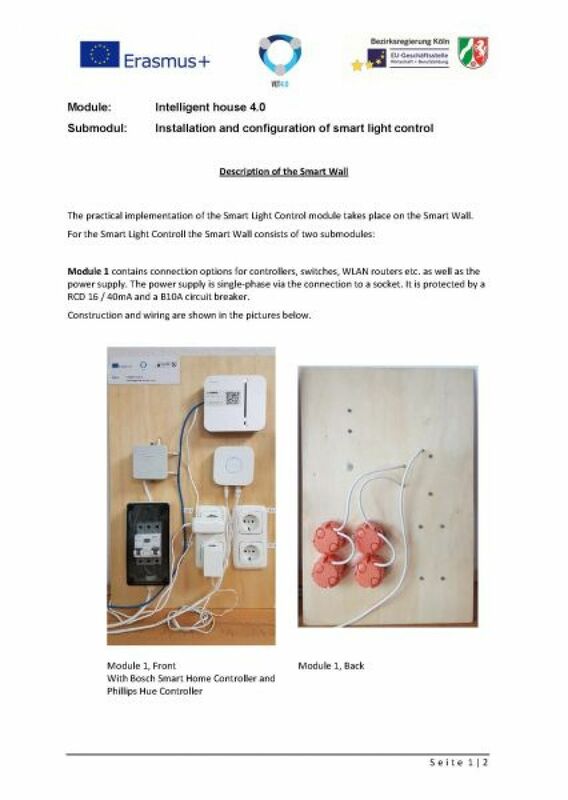 The document 1_Smart_Light_control_students-tasks-v1-ENG.pdf is an example for an open formulation of questions, the document 1_Smart_Light_control_students-tasks-v2-ENG.pdf is an example for narrow steps. The best way of collaboration is group work, 2 to maximal 4 students per group. Depending of the learning group, the first task of the described module needs 4 to 6 h, without a final documentation like the video clip or a detailed process-orientated project documentation. 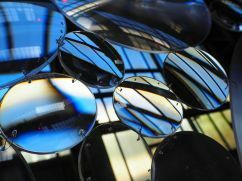 The documentation, for example, could be a video clip or a process-orientated project documentation.